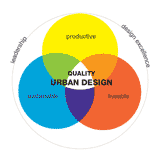 Urban Designers: Other consultants: Cardo Grogan Richards, Civil Engineering Consultants; Webb Australia Group (VIC), Lighting and Electrical Design Consultants. The Geelong Youth Activities Area (YAA) is a public recreational plaza at Western Beach on the waterfront adjacent to the Geelong CBD. It is an innovatively designed, flexible, multi-purpose outdoor youth-focussed area that contains open-air spaces suitable for a range of activities and events including markets, live music, art exhibitions, catwalk, dance, street theatre, BMX riding, basketball, skate boarding, interactive media, wireless internet and seating. The site is located in the heart of Geelong’s redeveloped waterfront precinct at Western Beach. Considered as prime waterfront land, for more than a decade the City of Greater Geelong Council was approached by developers wanting to develop the site for residential or commercial uses. When Council announced plans to build a Youth Activity Area on the site, feedback from developers was that the space was too important for young people. Council’s view was the opposite—Council considers this prime location to be too important not to be given to the youth of the City. One of the main objectives of the project was to help young people feel more connected to the broader community. An important part of achieving this is to provide them with quality activity areas and facilities throughout the region, not just in the outer suburbs where land is cheap and plentiful. The YAA provides young people with a venue, programs and activities that are accessible in location, choice and affordability and that encourage participation, social interaction, recreation and community inclusiveness. Located opposite Deakin University, and close to Geelong Railway Station and Bus Interchange, the area provides young people with representation at the waterfront precinct in the heart of the CBD. Young people were actively involved in the planning and design of the facility through focus groups, surveys and one-on-one meetings over a two-year period, contributing to a broad range of design topics from conceptualisation to material selections. The YAA provides a public space for young people that incorporates an open-air performance area suitable for a range of activities, events, markets, live music and art exhibitions, a basketball half court, skating surfaces, viewing platforms and seating. MP3 connectivity, a sound system and performance lighting are incorporated into the YAA’s design. Future expansion of the area (Stage 2) is planned and will include a multi-media area including a screen projection facility, wireless internet, interactive touch screens, more viewing and seating terraces, a climbing wall and pedestrian access directly to Gheringhap Street. The YAA is an innovatively designed, multi-use outdoor youth area and contains open-air spaces suitable for a range of activities and events including markets, live music, art exhibitions, a catwalk, dance, street theatre, BMX riding, basketball practice area, skateable surfaces, interactive media, wireless internet and seating. The YAA is set up to cater for a multitude of event and program opportunities including concerts, markets, drama and displays. To achieve this, the park has been designed to be one large cascading terrace that creates an amphitheatre with a central performance stage. Sculptural steel frames provide shelter, event gantries, signage and housing for projector, screens and art display. Surrounding the terraces and active areas are a mix of seating and refuge spaces for both informal viewing and socialising. The YAA provides a diverse range of opportunities for sport, art, music, drama, multimedia, display & education programs which reach a far broader range of potential users. It is also an important “contact point” for youth workers to provide “outreach” services to youth who may be experiencing difficulties. 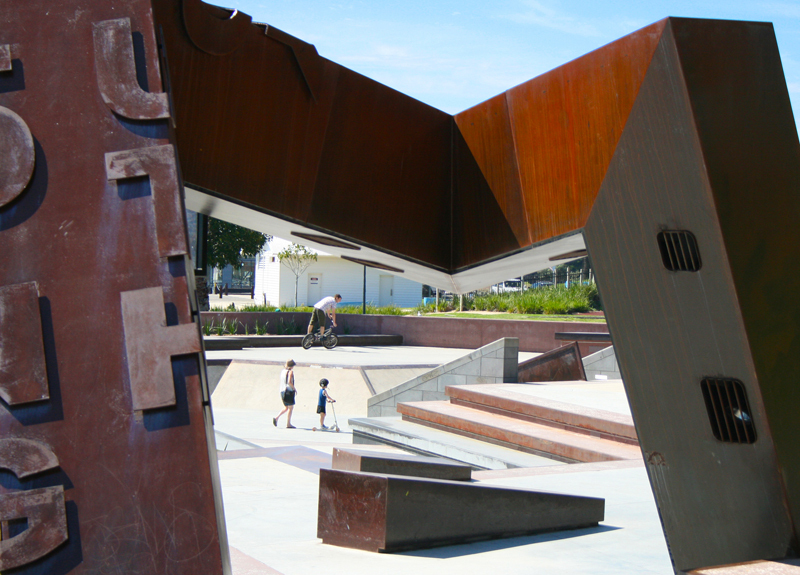 This major public urban recreation space was delivered by the City of Greater Geelong with support from the Victorian and federal Governments. Designed primarily as an events space, it has the added benefit of being skateable. The energy of a permanent group of young skaters has been embraced by the wider community who drift into the space. The YAA provides the whole of the local community with accessible infrastructure in the heart of the Geelong’s CBD for both day to day use and for events. Colours, exposed aggregate concrete and rusted steel mix to create earthy durable tones. Bold use of steel provides detail to the edge of steps and ledges and highlights the concrete banding throughout the project. The colours of the honed concrete and steel are matched by the vivid red LED strip lighting evident at night. The area consists of a myriad of different levels and planes made of a variety of materials. The materials used included coloured insitu concrete, bluestone, granite and steel and they were chosen to break up the expanse of concrete and provide visual interest. All of the surfaces and materials had to be robust and provide high-quality skating surfaces. The various pieces of the YAA fit together much like a jigsaw to ensure the area retains a high degree of landscape aesthetic. All the engineering is hidden within the construction including material joins, concealed lighting and sound. The area is distinguished by its angular forms and large rusty sculptural elements. Drainage of the entire site is hidden in slot drains of around 10mm in width at the base of each step that can barely be seen. This was undertaken to remove water from the skating surface as soon as possible to keep the park dry and provide greater ‘skatability’. The area was designed to be a comfortable space for young people, as well as for the wider community. As well as spaces which cater for a variety of active recreation activities, the area has grassed areas that cater for passive recreation including a large grassed embankment. Three large steel structures are incorporated in the space, which help to make it comfortable and functional. They also provide visual interest. The first provides shelter for sun and rain; the second provides housing for the stage lights and sound and multi-media equipment and the third contains a basketball hoop and the back of house connections for the sound, lights and multi-media. The lighting has been kept to a minimum luminosity to limit night-time use of the facility. Concealed LEDs have been used under each step and plane to add an interesting aesthetic and nighttime lighting without providing flood lighting. The YAA provides the whole of the local community with accessible infrastructure in the heart of Geelong’s CBD for both day to day use and for events. The energy of a permanent group of young skaters has been embraced by the wider community who drift into the space. 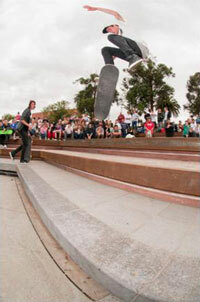 Since opening, the YAA has received rave reviews in Skate Park, the Australian Skate Park Guide. 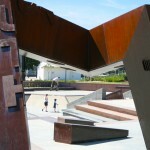 The Guide, which reviews over 1,050 skate parks nationally, said the YAA was a high quality “Barcelona style plaza” with great facilities and a “cutting edge” design. It was scored 5/5 stars and described as “easy on the eye and grouse on the grind”. The YAA received another positive review in popular skating magazine Slam, which advised skaters to check the park out. Local residents were initially apprehensive about having a skate park on the site due to concerns about safety. To address these concerns, the principles of safety through good urban design were considered throughout the design and construction process. As a result, anti-social behaviour has been very minor since the opening of the precinct. The YAA has been embraced by local youth who seem to be taking pride in looking after the area and keeping ‘undesirable’ elements away. Despite initial concerns about safety, the YAA has been received positively by the community. The YAA has been integrated with and connected to the nearby Corio Bay foreshore, Cunningham Pier and the established festival space at Steampacket Gardens. The YAA sits adjacent to the Baywalk, a continuous walking path nearly 3 kilometres long stretching from the eastern end of Corio Bay to the western end. This makes it easy to walk to the site. Smaller paths branch off the Baywalk to sites along the foreshore, including to the YAA. The YAA was designed to be flexible and adaptable to changing needs. Being evolutionary was considered to be critical to its design to ensure a high degree of cross-generational ownership into the future. A ‘social’ model was explored for the selection of the site. It looked at where young people want to be. The model was also used to consider how the space could be engaging and truly inclusive for young people and the broader community. Through community consultation, a need was identified for an appropriate space for youth activities at the waterfront precinct of Geelong. Many young people were attracted to the redeveloped waterfront; however, the social and leisure needs of young people in the late primary school and high school age brackets were not adequately catered for there. Feedback from families visiting the waterfront highlighted the need for activities suited the interests of young people to enable families to enjoy the waterfront precinct as a family unit. Further feedback highlighted the need to have a designated area for young people that not only meets their needs, but also connects them to the broader community. The YAA offers a unique and highly personal space for the youth of Geelong. It is a practical solution to connecting youth with their community. Initial consultations were held with local young people to find out their needs and desires for the space. The conceptual design process incorporated the elements that the young people consulted believed would be highly regarded by the youth community of Geelong. There was a strong desire to build not ‘just a skate park’, but an area that catered for many different activities and could be used formally and informally. That the project as a whole would add to the waterfront aesthetic. The project was funded by the City of Greater Geelong, the Commonwealth Department of Infrastructure, Transport, Regional Development and Local Government and the State Government of Victoria through the Department of Sport and Recreation and the Department of Victorian Communities. Donations towards the project were also received from the Ford Motor Company and G-Force Recruitment. Australian Institute of Landscape Architects, Winner Top Honour, Victoria Medal for Landscape Architecture, Annual Design Awards. Australian Institute of Landscape Architects, Winner, Award of Excellence in Landscape Architecture, Southern Region Design Awards. Cement & Concrete Association of Australia, Public Domain Awards, State Winner Victoria. Cement & Concrete Association of Australia, Public Domain Awards, Winner Precincts. Institute of Public Works Engineering Australia, Victorian Excellence Award. Planning Institute of Australia, Australia Award for Urban Design. Australian Institute of Landscape Architects, Winner, Landscape Architecture Award, National Design Awards. The project’s construction was unique because it employed many elements and techniques that had not been used on this scale previously. These included the integration of pre-formed steel edges into concrete forms, the coloured ground and surface finishes, the concealed strip lighting and the steel structures integrating high-tech electronic equipment. The design and construction teams were committed to excellence ensured delivery of an outstanding project. The YAA has been a great success and is a valuable addition to Geelong’s multi-award winning waterfront precinct. The project’s success is in part due to the extensive planning, research and consultation undertaken with all stakeholders throughout the design and construction process. This ensured that the area would meet the needs of its future users and provide a unique design outcome worthy of its high profile location.